Making the Choice: In-Home Care or Nursing Home? If you have an aging parent, the term “age in place” is a topic that comes up in many conversations about their future. While most seniors want to remain in their home for as long as possible, life occurrences may not allow. And if they have reached a point when they cannot physically care for themselves, one of the options that must be considered is moving your loved one to a nursing home. Making the decision to have your aging parents remain in their home or to move them into a nursing home is a difficult choice. In-home care offers companion and personal care service to help seniors maintain their freedom and independence. Nursing homes offer a high level of medical care with experienced physicians and nurses on staff. However, a nursing home can come with resistance from the senior because they believe they may lose their freedom and independence, and they fear the expense of such care could be outside their budget. In-Home Care is preferred in many family situations. However, the need for nursing home care becomes the obvious choice when your loved one requires more than basic daily care such as dressing and bathing. If they have physical and/or mental conditions that require more specific or skilled care and attention because of rehabilitation, medical, or specialized supervision needs, they may need a nursing home. In-home care allows your loved one, who is still self-sufficient, to live safely in their own home. Home care can assist seniors, those recovering from a medical illness or surgery, or adults with special needs or a disability who need some assistance to live independently. In-home care is ideal when your loved one needs non-medical support and services. Home care providers can adjust their non-medical services based on your loved one needs. Care can be day-to-day, overnight, or scheduled care throughout the week depending upon needs. If your loved one just needs support around the home, services can include help with light household chores, such as laundry, vacuuming, and other chores to help maintain and safe and healthy living environment. If your loved one wants to live at home but needs to reduce the amount of driving they do, a caregiver can provide transportation to run errands, doctor appointments, or social events with friends in the community. If your loved one seeks one-to-one care and individualized attention, an in-home caregiver provides that service. Caregivers can be another set of eyes ensuring that your loved one is taking the right medications when required, is eating properly, dressing, bathing, and is able to function in and around their home. In-home care is customized based on a family’s needs and can be adjusted as your loved one ages. Home care provides peace of mind to family members who do not live close by. They can feel confident that their active senior who lives independently is receiving both the personal and companion care they need. Your loved one needs constant or almost constant care every day. Your parent needs skilled nursing care, orthopedic care, physical, occupational and speech therapy, and/or wound care. They can only walk with assistance or continual supervision. Continence and toileting care are needed daily. Living at home alone becomes dangerous due to difficulty seeing or hearing, making navigating the home on their own a challenge. Your parent has difficulty making daily decisions or is experiencing memory and recognition issues. Problematic behaviors become more frequent, such as a verbal and physical abuse, acting inappropriately in public, resisting necessary care and wandering. 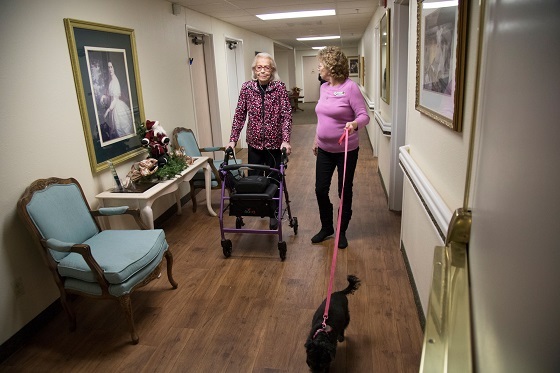 The choice between in-home care or a nursing home is a tough and emotional family decision. While most adult children want to have their parents live at home, the care their parents need may be too overwhelming and may require skilled services that go beyond their fundamental capabilities. A nursing home might be the best option and best place for a loved one to live out their remaining years. What are your thoughts? We’d enjoy your feedback. Please comment below or join our ongoing conversation on in-home care and other options outside them home on our Facebook page.